‘The Sexual Harassment of Women at Workplace (Prevention, Prohibition, and Redressal) Act, 2013’ has been a progressive step towards providing women a safe work environment in India. After all, in the last 5 years since it became a statute, several aspects of the Act has proved to be advantageous to employees and to the organizations that have enforced it as well. But, would you call the PoSH Act (as it is popularly referred to), as the panacea that can magically eradicate the harassment of women at the workplace? For the PoSH Act to be the antidote that it is touted to be, there is a need to make it far more robust. Overcoming certain disadvantages of the Act requires enhancements that need to be addressed urgently. The ‘Eﬀectiveness of Sexual Harassment of Women at Workplace (Prevention, Prohibition and Redressal) Act, 2013’ survey1 conducted in 2018 by KelpHR, discovered that a significant 77% of organizations were fully compliant with the Act. The survey revealed that the key benefits of implementing the PoSH Act were – 10% of the respondents believed that attrition has reduced; 45% find their workplaces safer, and 91% quote enhanced awareness about the Act. These numbers are a reflection of the advantages of complying with the PoSH Act. In addition to the Act, the Government of India has also provided the ‘Sexual Harassment electronic Box’ (SHe-Box), which is a ‘single-window’ access to every female worker, to register complaints around sexual harassment. Complaints submitted to ‘SHe-Box’ are directly routed to the concerned authorities for further action. Female workers subjected to sexual harassment can resort to accessing the SHe-Box to record their complaints. Together, the PoSH Act and the SHe-Box have had a positive impact on employees and on the organization, in fostering an environment that helps weed out the sexual harassment of women in the workplace. The PoSH Act has proven to be a positive enhancement of the Vishakha guidelines. The Act comprehensively includes the safety of ‘external’ women visiting the workplace and covers ‘verbal’ sexual harassment as well. Also, it establishes the onus of resolution of complaints onto the organization. These have been desirable enhancements to the Vishakha guidelines. The Mandated Act has created so much buzz in the industry and thanks the media for enhancing the awareness on this. With Access to social media on their fingertips, employees can report or post any incident immediately. And this is picked up the media as well and made viral. Thus creating a culture of zero tolerance to any form of sexual harassment at workplace and this in turn has helped spread awareness on various instances. The fear of social media/media to some extent has helped organisations to deal the complaints with utmost sensitivity and priority. Data shows that nearly 5% of male workers are subject to sexual harassment in the workplace. Unfortunately, unlike their female counterparts, male workers cannot route their sexual harassment complaints through the PoSH Act since it provides cover for female workers only. The above mentioned KelpHR survey findings indicate that the inclusion of male workers under the ambit of the PoSH Act will favour the organization with a better buy-in from male employees, in implementing the Act. Allegations of sexual harassment need to be filed within three months of the incident, and extendable up to six months when required. However, given that sexual harassment is an incident of heavy consequence in the life of the victim, the time period of six months needs to be extended further to enable the victim to overcome the following trauma to file a complaint. In the absence of compliance audits by the Government, in the year 2017, only 539 charges were recorded under the PoSH Act. This translates to two incidents of harassment across corporate India per day and appears to be a disputable reflection of ground reality. For the Act to be more meaningful, strict audits need to be enforced by the Government regarding the compliance of the Act. When coupled with the mandatory disclosure requirements of the company’s Internal Complaints Committee, it will make for a strong law. The PoSH Act needs to provide clarity around handling incidents of sexual harassment based on evidence but without written complaints from complainants. Similarly, guidelines for addressing complaints that are anonymous in nature are also required. Besides, it should also mandate a centralized method of reporting complaints for better tracking within organizations. 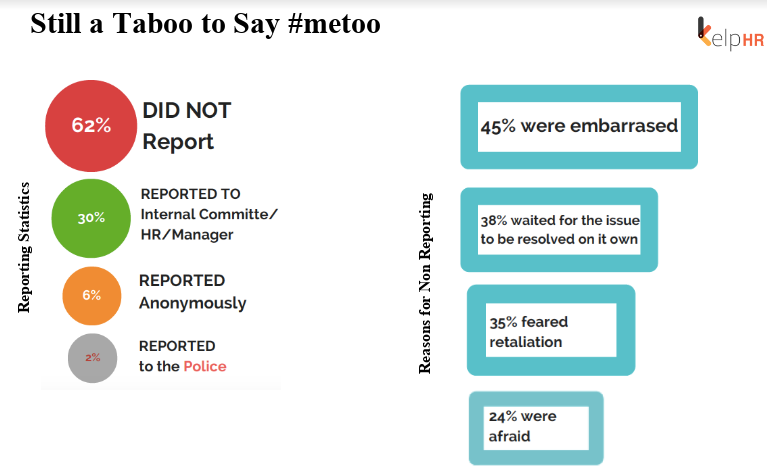 62% of sexual harassment incidents at the workplace do not get reported despite the existence of the PoSH Act and the SHe-Box. The reasons for not reporting are mainly due to embarrassment (45%), waiting for the issue to resolve on its own (38%), the fear of retaliation (35%) and anxiety (24%). The Act needs to specify stringent anti-retaliation measures to alleviate the fear of retribution for lodging a sexual harassment complaint. The naïve optimism surrounding the advantages of the PoSH Act need to be balanced through a deeper understanding of the disadvantages hidden within the Act in its current form. As we look forward to enhancements from the Government in making the PoSH Act robust, it would benefit organizations to invest in developing a culture that does not allow sexual harassment to exist. 1 The “Eﬀectiveness of Sexual Harassment of Women at Workplace (Prevention, Prohibition and Redressal) Act, 2013” survey by KelpHR was administered to 160 professionals from 200 companies across India. The survey participants included senior professionals like HR Heads and members, Internal Committee presiding officers and members, legal heads and CXO’s of organizations across India.